1inch Bromine Tablets - 50lbs. Bromine is a powerful, safe alternative to Chlorine. We offer 1 inch Bromine tablets in 10, 25 and 50lb. Buckets. Bromine should be considered for hot tubs, spas and pools because the Bromine neutralizes the bacterial content of the pool continuously and stays present in the water for much longer. Because of this, less bromine is needed when disinfecting a pool. Also many pool and hot tub owners find the chlorine fumes to be unpleasant or even dangerous if they are exposed to them for long periods of time. On the other hand, bromine has an imperceptible smell, both while you are in the water as well as on your skin and clothes when you emerge from the water. Bromine is often used by people with sensitive skin, as the bleach components of chlorine are very harsh on certain skin types and can cause excessive dryness. A pool filled with bromine disinfectant will have fewer reported issues of skin or eye irritation. Furthermore, since bromine contains no bleach content, water treated with it is much easier on swimsuits. 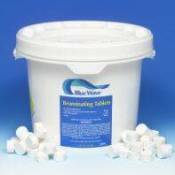 Used in hot tubs Bromine will perform better in the warmer water than Chlorine. 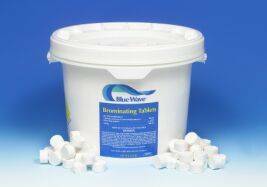 If used in a pool the Bromine tablets must be used with an automatic feeder or chlorinator. These Bromine tablets are pre stabilized so you save money on stabilizers and pool water conditioner. Available in 10 lbs, 25 lbs or 50 lbs Tubs.